The cost of US military operations is nearly incalculable when we consider the loss of life and how many families have been shattered directly by current and recent conflicts that the US has been involved in. While we may all wish that these events had never happened, it would be unrealistic to think that we do not require a military to protect what we hold dear. Many Americans however would agree that the Department of Defense’s spending is in many cases quite excessive. 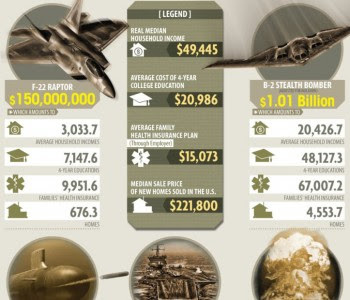 The following infographic depicts the actual cost (in USD) of various military equipment, vehicles, and programs. While this list of items that the US military purchases is far from all-inclusive, it aims to give you an idea of just how much money is spent on them and what that money could be used for instead of more equipment for war. While some figures such as equipping one soldier may not be mind-blowing, remember that we have hundreds of thousands of active duty, guard and reserve troops that need to be equipped, and we never buy cruise missiles one at a time.